Modern Boating Fishing Boat of the Year for Australia 2009. 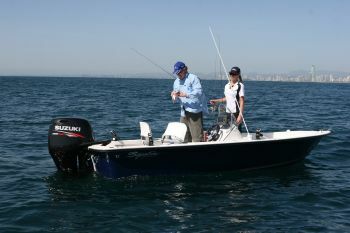 The Haines Signature 485SF is built for fishing but handles other jobs just as well. Without doubt the softest riding, driest, most predictable, most fun and above all, safest handling hull in its size we have ever tested. A forward casting platform with seating position, fish box and anchor well add to fishability. An aft casting deck, live well and live bait tank are configurations already available – with more to come. Innovation has never been a stranger to Haines Group boats but few of their many earlier initiatives match the recently released 485SF. Translated from ‘Haines-ish’, this designates a 4.85m sportfisher. However, there’s so much more to this boat than that. New resin transfer technology involves GRP laminates being created by injecting tightly controlled amounts of resin into a two-piece mould. It produces mouldings with smooth finishes on both sides; they are thinner, stronger and lighter than a traditional fibreglass lay-up inside a female mould only. Haines Group technicians first used this technology to produce components of a (then) new 675F model we tested in Modern Boating. From this experience they went on to develop an even more sophisticated process they now call ‘Rivale’, which stands for ‘resin injected vacuum assisted low emission’. ‘Resin injected’ is self-explanatory. ‘Vacuum assisted’ refers to the use of vacuum bagging, a technique often used in US built boats, although only occasionally seen amongst Aussie boat builders. ‘Low emission’ refers to the new process’ strict control of styrene emissions-a greenhouse gas inherent in traditional GRP boat building we’re better off without. What the Rivale handle doesn’t explain is a dramatic reduction of labour intensity during production. At a recent release of the 485SF and new 70, 80 and 90hp Suzuki outboards, John Haines (junior) revealed that using Rivale technology, 485SF hulls can be built in 14 man hours instead of more than 50, facilitating their ability to offer a better boat at competitive cost. Which explains this boat in a nutshell. The new 485SF’s hull involves two Rivale mouldings forming the interior and the outer hull, with foam filling between, all bonded into a single unit by another Haines Group developed proprietary process called Nexus. Readers may have observed demonstrations involving large 4WD’s parked atop inverted 485SF hulls at Boat Shows this season. After seeing that, you can form your own opinion about the structural integrity this construction achieves. From here we have to tell you that the 485SF becomes somewhat like that oft quoted set of steak knives-wait… there’s more! The boat you see on the cover sits at the top of the range, powered by one of Suzuki’s new 70hp four-stroke motors with a price of just over $35,000. At press time, all the details weren’t finalised, but this new technology hull will ultimately be available in several versions and in various packages ranging from a bare bones tiller steer model with a 30hp motor for around $14,000; up to (and beyond) the cover boat. Confirmed configurations include side console and centre console options. An aft casting deck, side decks, under-floor fuel tank, built-in icebox, a live well and a live-bait tank are already available. The basic inner moulding includes a bow casting deck with a moulded under-floor stowage well and separate ice/fish box (or more stowage as you see fit), an anchor well and non-slip surfaces throughout. A rod locker along the portside and an electric motor bow mount were soon to become options as we went to press. Such was the enthusiastic reaction to this groundbreaking new boat during the Boat Show season that getting our hands on one to test proved problematical, despite the Modern Boating team being well aware of its coming. Here I should confess some involvement during development of the 485SF. My own Haines Traveler TD149 is in fact an early prototype and its DNA is plain to see. My boat is a bit rough around the edges, as prototypes will be, but is on its fourth fishing season now (yes, the 485SF has been awhile coming). To call it an unqualified success would be ridiculously understating the obvious. My favourite story from its history so far involves Greg Haines, a full moon night on Queensland’s Lake Awoonga, and a barramundi I conservatively estimate at 70 old-fashioned pounds. Greg’s no more given to nerves than you’d expect from a bloke who’s literally lived boats his whole life. He’d been unmoved by howling winds and almost surf conditions along the lee shore we were fishing. But his hand shook like a literal leaf in a gale when responsibility fell to him to land the 1.25m-long fish. Unlike so many fishing stories, this one ended happily when the big one got away-after we released it. Thanks Greg! Actually getting onto the water in this boat and physically testing it held unprecedented interest for a bloke who gets in and out of enough boats to be fairly blasé about anything new. At its official release, fellow Modern Boating correspondent Kevan Wolfe and I snaffled a 485SF to run some performance figures, just as John Haines (senior) happened along in his big flybridge cat all loaded down with boating snappers, including our honourable editor. To cut a rapidly lengthening tale to the chase, Kevan and I ended up posing the boat for the photographers-loving every moment of it! Over the years I’ve come to expect Hainesy’s hulls to be sure footed and predictable and yet even with that august heritage, the 485SF stood out as something particularly special. Our accumulated wakes became absolute mish-mashed surface chop after several runs past the cameras and still we were able to indulge high-speed turns and lurid power slides. Our antics evolved to barely short of silly before the shooters called enough; leaving a pair of veteran boat testers looking at each other, and a question as to what we’d proved, hanging in the air between us. It was a work of moments to agree this is without doubt the softest riding, driest, most predictable, most fun, and above all, safest handling hull in its size we have ever tested. That’s all the more remarkable for our ‘photo opportunity’ going way past the limits commonsense ordinarily imposes on boat tests. Kevan’s stopwatch showed the 70hp was planing from a standing start in a few hundredths past three seconds. Modern Boating’s official GPS showed a top speed of exactly 35 knots at 5900rpm. I suspect a slightly smaller pitch prop might fudge some more speed from higher revs. Sheer speed is more or less irrelevant to fishing boats-apart from fishing tournaments where point-to-point times need to be brief. But considering that few boats are purchased purely to fish from, and that most will also serve as wake toy tow vehicles and general fun machines some of the time, the new 485’s super fishing friendly interior is merely one of its many assets.